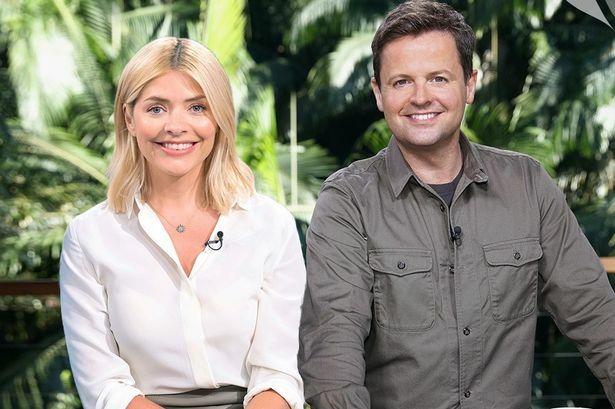 Holly Willoughby made her debut appearance on I’m a Celebrity last night. Despite getting off to a good start, she went on to make a few blunders and has been criticised by viewers for her “wooden style” of presenting. Hitting back against the criticism, Holly has responded in an unusual way. 43 year old Dec began the show by introducing his new co-host who was literally standing in Ant McPartlin’s place to the left of Declan. This has been An’ts spot for the last 16 years. “The more eagle-eyed viewers among you will notice a big change to this year’s show” Dec said. Declan seemed to take this in his stride by laughing at her joke but seemed less impressed later on in the episode when she went on to make a huge blunder. It was announced that Ant would not be presenting alongside co-presenter and childhood pal a few months back when he was convicted of drink driving in April. It is the first time Ant and Dec have not presented I’m a Celebrity since it first aired in 2002. Although he wont’ be joining Dec down under this year, Ant did wish the new presenting team good luck ahead of the show – and didn’t miss the opportunity to slip in a dig at Dec’s lack of inches. The absence of Ant McPartlin didn’t deter viewers evident by the number of viewing figures which is said to be the highest since 2013. 11 million viewers tuned in last night to watch the first episode which is an increase of 700’000 from last year. Contestants for It’s a Celeb 2018 include 10 brave (or foolhardy) celebrities ranging from politicians, to actors and sports personalities. Harry Rednap, John Barrowman, Anne Hegerty and Nick Knowles are just some of the stars that will be put through their paces for our entertainment over the coming few weeks. As always there will be one or two mysterious late arrivals who will be dropped into the camp. TV and radio legend Noel Edmonds is widely rumoured to be one of the additional camp members. 37 year old Holly made a big blunder during the first I’m a Celebrity challenge which was pre-recorded a couple of days ago. The contestants had to climb into a metal tower 100 feet above the jungle floor and collect flags with numbers on them. The team that completed the challenge in the quickest time would be crowned the winners. To do this however, someone needs to be keeping track of the time – that was Holly’s job. Confused Holly said: “I can’t remember what the others got.” Despairing co-host Dec was dumbstruck as Holly said that she could not remember the red team’s time. “I’m not good with numbers,” she added, but luckily the producers had been monitoring the time and had written it down. Dec declared that both teams got all 10 stars, but one did it faster than the other. The yellow team took the title as winners with Rita Simons and James McVey, got a time of 10 minutes and 47 seconds. While the reds, comprised of John Barrowman and Sair Khan, got a slower time of 11 minutes and 36 seconds. Easy going host Declan Donnelly look shocked and unimpressed at Holly’s slip-up but laughed it off and made the This Morning Host feel okay about it. Hoards of viewers took to twitter after the airing the first 2018 episode to give their opinion on 37 year old Holly’s presenting with some fans commenting on the chemistry (or lack of) between the pair. Viewer Paul said on twitter: “Dec is doing his best, bless his little cotton socks, but I’m not feeling much comedy return from poor Holly. Some viewers have praised Holly’s debut claiming to like her caring nature. “I actually really like Holly on this show, she brings a lovely, funny and caring vibe that I love,” said one viewer. Another added: “Enjoying this so far, think holly is doing a great job. The presenter and former model clearly felt for Emily during the bushtucker trial ‘Viper Pit,’ where she had to put her hand into a small pit of snakes and was most concerned when she was bitten by one. The 37 year mum of 3 responded to the cruel feedback on her debut performance in a low-key way. Holly simply shared a sunshine picture of herself relaxing by a pool in Australia during her day off from filming with the caption: “Vitamin D…” She also added some sunshine emojis for good measure. Willoughby said she was “overwhelmed” to be on set and “massively relieved” for it to be over. Donnelly revealed Willoughby had been in tears after he first showed her the “magical” camp ahead of welcoming the 10 celebs into their new home on Sunday night.